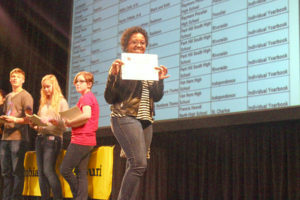 J Day is MIPA’s annual journalism celebration held at the University of Missouri in Columbia in late March. It is a full day of speakers, workshops, awards and fun! And it’s FREE for all MIPA member advisers and their students. Dozens of schools from across the state bring their entire staff on a bus to Columbia, arriving between 8 a.m. and 8:30 a.m. to Jesse Hall to gather for the kick-off keynote speaker. Come early and enjoy a staff photo slideshow, visit vendors, and wake up with games to play and prizes to win. Upon arrival, students may enter the Write-Off and the Photo Shoot-Off competitions where students write stories and take photos to submit under deadline pressure on event day in the hopes of grabbing an award during the awards ceremony. 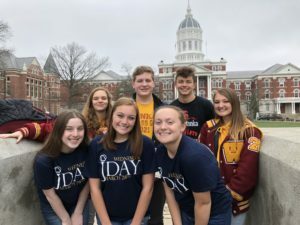 Students wear their own staff shirts or can purchase J-Day T-shirts in advance for only $10-12 using an online order form and spread the J Day spirit. Following the Keynote, students can choose from dozens of journalism-related workshops and learn from a variety of professionals. Multiple class blocks offering nearly three dozen sessions ranging from yearbook to newspaper/magazine to broadcast, photography, current events, trending topics and more are scheduled. There are also adviser-only sessions. Plus, advisers are invited to a MIPA member update meeting to find out more about what MIPA offers its members and how the organization runs. Lunch is often a time for staff members to gather for team building at a local restaurant of their choosing or split and enjoy one of the many Mizzou eateries on campus or Columbia restaurants within walking distance. Following lunch, the more than 1,500 students gather back at Jesse Hall to honor award recipients including the Challenge and Photo of the Month winners, Student Journalist of the Year, Teacher of the Year, Administrator of the Year, Emerging Journalism Educator and more. Students will also celebrate the All-Missouri award winners on stage, and have other certificates earned ready to be picked up after the ceremony. 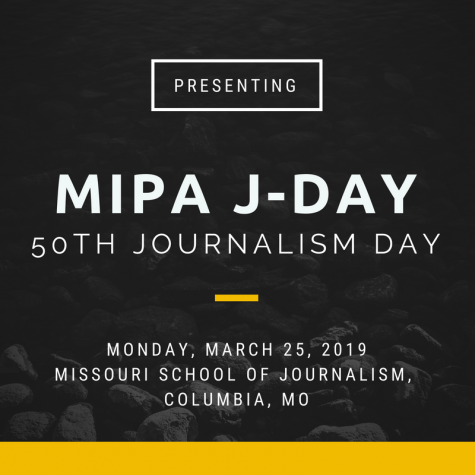 Journalism students from all MIPA member schools are eligible to win awards by submitting in February to theMIPA J Day Contests. Schools wishing to attend this FREE event still need to register in advance for the Monday, March 25, 2019 J-Day. Registration closes at midnight on March 18. Our 50th J-Day promises to be the best ever! Student registration for particular sessions is not needed. Just complete teacher and school information, the total number of students and teacher lunch request, if needed. Free parking for busses will be at the Hearnes Center, if you need parking for cars/vans, use the link to MU parking provided in the registration confirmation email. Don’t miss out on this valuable educational and celebratory day for your journalism students! Bring your publication staffs and join us at the MU School of Journalism in March!